The prenatal classes are designed using the best exercises from yoga, pilates, barre and fitness training. Our qualified instructors will educate you on the safest and most effective way to exercise during your pregnancy. Classes are open to all levels of experience. Do I need medical clearance before attending classes? We strongly advise all clients receive clearance from their doctor to exercise whilst pregnant. All high risk pregnancies must be cleared by your doctor. Do I need to book a class to be able to attend? We do recommend booking your place in the prenatal classes. Classes are capped for quality control and as a result often book out. Can I take out a membership whilst I’m pregnant? Yes, you can. The Premier Membership is the most popular membership for prenatal clients with the flexibility to suspend for up to 3 months (90 days) whilst you are on maternity leave. There is a minimum 4 month commitment ( 8 fortnightly payments) that must be fulfilled on your contract before exiting ( suspension period not included). See Premier Membership for full terms and conditions. Are there any other classes I can attend other than the Prenatal Fitness class? Yes, our Barre, Yin and Restorative Yoga classes are also prenatal safe provided you are not suffering from any major pelvic instability. Please contact us if you have any questions regarding this. Checkout our timetable to book a class. This class is specifically designed to help you regain strength and stability postpartum whilst spending time bonding with your baby. Exercises include a mix of barre, pilates and yoga to help you lengthen, strengthen, stretch and tone the body safely. 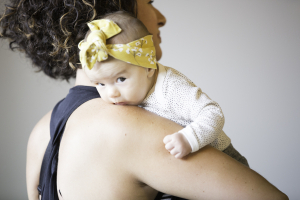 The guidelines for returning to fitness postpartum can vary depending on your circumstances, so we advise getting cleared for exercise by your medical practitioner first before returning to class. Bring a baby blanket to lay over our mats and any toys that will help keep your baby occupied during the session. If you have a comfortable and breathable carrier we suggest bringing it with you so that if your baby becomes unsettled, you can strap them to you and do some some standing exercises with your spine supported. Please note our studio is located upstairs, so bring a carrier or pram that can easily be folded and transported. 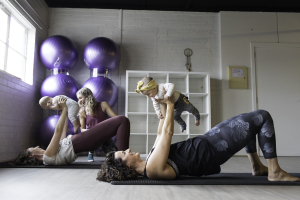 This 6-week course is specifically for those wanting to return to exercise after giving birth and is designed to help you regain pelvic floor strength and assist in rehabilitating abdominal splitting (diastasis recti). Experience a full body workout in an intimate setting and spending time bonding with your baby and meeting other mothers. Week 3 – Align Your Spine. Re-align the pelvis and spine after birth. Week 4 – Stretch & Strengthen Upper Body. Shoulder posture and well-being. Week 5 – Stretch & Strengthen Lower Body. Lower back and pelvic stability. Week 6 – Creating Healthy Habits.Tips to assist your posture whilst caring for your baby. Got a group of Mama’s you want to work out with? We offer a private 4 Week Postnatal Pilates course available to you and your gang of mamas. All course bookings require a minimum of 6 people to run. If you have an interested party send us an email and we’d love to hear from you! Looking for some stylish threads that feel and look good ? “From hidden nursing clips to leggings that expand over your baby bump” Mummactiv has your fitness needs covered with a stylish, supportive and affordable range of activewear that combines the best of fashion and function to meet your pre and postnatal needs. Available for purchase from our online shop or retail store.